Reese Eddings (see the cover by Julie Dillon) is the human captain of the TMS Earthrise, a “rattletrap merchant vessel” that has been barely breaking even in United Alliance space. Six years ago, Reese was facing bankruptcy and the loss of her ship when a Mysterious Benefactor offered to cover her debts in return for a favor someday in the future. Reese has not been any more successful since then, and she has been dreading the return of that benefactor. When the latter does return, though, she does not want the money repaid, but for Reese and the Earthrise to rescue an “investigator” imprisoned on a non-Alliance planet, before he can be sold into slavery. Reese dropped into the console seat and gaped. She’d never expected to see a real Eldritch in her lifetime. The race’s isolationism and xenophobia were so extreme they’d become a stock offering in her yearly romance subscription – Eldritch women learning to love despite their social conditioning! Eldritch men reluctantly learning to touch their alien lovers! Paintings of pale Eldritch in unfathomably silly costumes, drooping artistically in the arms of humans… that and the occasional flat photo in the u-banks were Reese’s only exposure to the people. The Eldritch didn’t leave their planet. The two bipedals, Irene and Sascha, stopped working. Kis’eh’t, her stocky centauroid shape barely visible over the slope of the belt, continued pushing the bins. ‘What’s up, boss?’ Sascha asked, grinning. Unlike his twin sister, he did not wear socks on his tail or his feet. ‘She means we’re not getting paid for it,’ Sascha said. Kis’eh’t snorted from the other side of the conveyor belt. ‘Someone must have held a palmer to her head, then,’ the Glaseahn said in her clipped accent. Reese leaned back in her chair, letting her silence speak for her. As she expected, Bryer, the Phoenix, had nothing to say; the giant birdlike creature rested against the front of the chair, straddling it so as to give the full length of his metallic plumage unrestricted space. Kis’eh’t, while obviously perturbed, did nothing beyond wrinkle her dark, furry brow and lay back her feathered ears. She had more limbs than all of them: two black arms, four black and white legs, and two stunted leathery wings protruding from her second, horizontal back. And a tail, black with two white stripes running down it, which currently flicked against the cool floor. 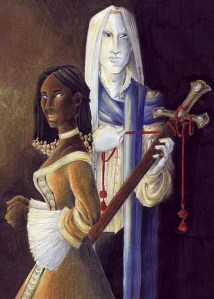 Irene and Sascha are Harat-Shar, also called tigraines; Kis’eh’t is a Glaseahn; Bryer is a Phoenix; and the round ball of fluff is Allacazam, a Flitzbe. 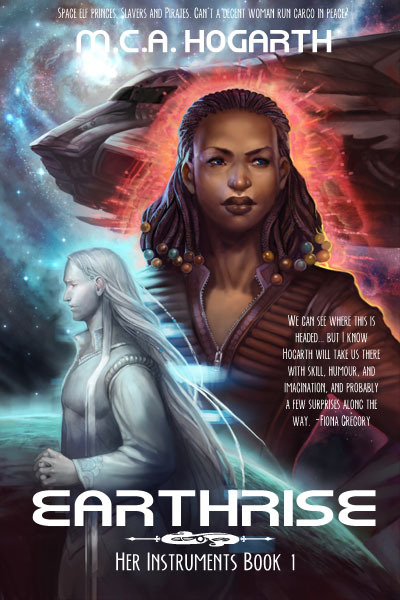 Earthrise is a well-written, typical example of space opera, in three parts. Reese and her crew are captured by space pirates; imprisoned with the Eldritch that they are supposed to rescue, Hirianthial Sarel Jisiensire, who is a doctor; escape together; get into a running space battle with pursuing pirates; and have a medical emergency where Hirianthial’s aid is crucial. And that is just in the first part. Hirianthial becomes a permanent member of the Earthrise crew, of course. Parts 2 and 3 … well, as Monty Python says, “And now for something completely different!” Part 2 is a “peaceful” interlude on Irene and Sascha’s homeworld of Harat-Sharii. In part 3, Reese takes a contract on the far side of the Alliance to get away from the slaver and pirates, and runs into unexpected new troubles of a different kind. The Pelted crew have major roles throughout; the Furry reader will not be disappointed. Reese says at the end, “‘After that… who knows? I guess we’ll go wherever sounds most interesting.’” (p. 401) Remember, Earthrise is the first volume in a trilogy. In addition to a space opera, as the cover implies, Earthrise is a romance. Reese fights furiously in all senses of that word to remain independent, as a tramp spaceship captain and as a woman; but from the moment that Hirianthial comes on stage, the reader knows that he and Reese are destined to Become One. Thanks for the review. I have quite a lot of respect fir this girl. I must compliment her on the cover. I've never like the covers she has done herself, but this one is gorgeous. I bet she will have very good sales on this book. Hiring an artist was a good move for her.